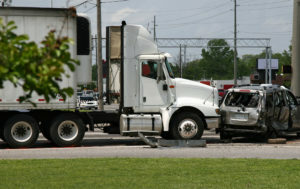 Injured in a Truck Accident? The Nutley, New Jersey-based Truck Accident Lawyers at Birkhold & Maider are here to help! As a state bustling with a wide range of industries, there are few places in New Jersey where drivers won’t share the road with cargo trucks, construction vehicles, tankers, 18-wheelers, and other big rig trucks. When all parties are responsible, traffic flows freely and everyone stays safe – but too often careless or reckless driving or other unsafe conditions cause accidents with the potential for catastrophic or fatal results. If you have fallen victim to a Truck Accident due to someone else’s negligence an experienced Truck Accident Lawyer at Birkhold & Maider, LLC, will evaluate your accident and help you chart the best course for a fair outcome. What Causes Truck Accidents in New Jersey? The Federal Motor Carrier Safety Administration released data that lists the top causes where a truck driver’s negligence or error resulted in a fatal accident as a failure of the vehicle operator to physically perform, failure to recognize dangers, failure to make the correct decision, and/or performance issues. Further, these ten factors were identified by the Administration as the leading factors associated with the causes above: brake problems, traffic flow interruption (congestion, previous crash), prescription drug use, traveling too fast for conditions, unfamiliarity with roadway, roadway problems, required to stop before crash (traffic control device, crosswalk), over-the-counter drug use, and inadequate surveillance. Truck rollovers, underride accidents, jackknives, and tire blowouts are the most common results found by FMCSA’s data analysis. Catastrophic injuries occur at an increased rate in accidents involving tractor-trailers, big rigs, 18-wheelers, tankers, and other commercial trucks – and it’s not hard to see why. Passenger vehicles are no match weight- or size-wise: Often the types of commercial vehicles involved in these crashes can be up to 25 times heavier. Secondary injuries can occur from dangerous types of cargo these vehicles may be transporting. I’ve Been Injured In A Truck Accident In New Jersey, What Should I Do? Injuries from these types of accidents can leave victims with thousands of dollars in medical bills at best, and grieving loved ones at worst. An experienced Essex County Truck Accident Lawyer at Birkhold & Maider, LLC, will evaluate your accident and help you chart the best course for a fair outcome. Our legal team is available to represent client cases in jurisdictions across the state of New Jersey. We serve clients in many townships and jurisdictions across New Jersey including Newark, Belleville, Paterson, Clifton, Passaic, East Orange, Bloomfield, Nutley and other townships in Essex, Passaic, Bergen, Union, and Middlesex Counties, and beyond. We will be your advocate as you recover from your Truck Accident so you can focus your energy on recovering your health. Contact The Truck Accident Attorneys at Birkhold & Maider Today. It is important that your Truck Accident injury claim or lawsuit is handled professionally and compassionately; you can rely on us to help you recover the damages you deserve. To learn more about our firm, we invite you to review our practice areas, attorney information, or contact us online for a free case evaluation. Or contact Birkhold and Maider at our physical address,189 Franklin Avenue, Suite 1, Nutley, NJ 07110, or call us at (973) 947-4670.